Set of 7 unique creatures and monsters for your fantasy games. 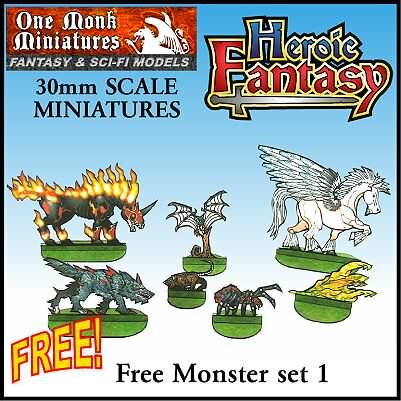 Included in this set is a Pegasus, Giant Rat, Giant Bat, Dire Wolf, Nightmare, Slime and Giant Spider. These are just samples from a large range of forthcoming monsters for any fantasy roleplaying or war game. Designed in 30mm scale and rendered in 300dpi for maximum detail and color. All One Monk Miniatures feature full front and back artwork, simple construction and are designed to look like traditional miniatures. Every model set includes the colored models ready to print and play, but also include uncolored versions as a printable PDF and high res graphic, ready for you to color with markers or with your favorite digital paint program. Mirto Musci 10 10 10 Great free model, only site on the internet that still has it available!